From technology advances to accelerated construction techniques, a domestic scan team sponsored by the National Cooperative Highway Research Program (NCHRP), American Association of State Highway and Transportation Officials (AASHTO), and Federal Highway Administration (FHWA) traveled the country investigating innovations and best practices for roadway tunnel design, construction, maintenance, inspection, and operations. Team members included representatives from State departments of transportation, academia, and FHWA. The team visited California, Colorado, Maryland, Massachusetts, New Jersey, New York, Virginia, and Washington in August and September 2009. Web conferences were also held with representatives from the Alaska Department of Transportation, District of Columbia Department of Transportation, and Pennsylvania Department of Transportation. The scan focused on highway tunnel inventory criteria; design and construction standards; maintenance and inspection practices; operations, including safety; and specialized tunnel technologies. Also considered were fire suppression, traffic management, incident detection and management, and repairs of existing tunnels. "We had the opportunity to learn about best practices and innovations that States are using, so that these can be shared with other States," said scan cochair Jesus Rohena of FHWA. "We also observed the challenges that tunnel owners are facing throughout the country as tunnels get older." Among the innovations being used to accelerate tunnel construction are prefabricated elements. These can include steel and precast concrete submersed tubes, prefinished manufactured steel ceiling panels, precast concrete floors, and precast concrete ceiling panels with tiles. Innovations to improve tunnel operations include specialized lighting technologies that control light intensity levels and prevent the "tunnel effect," which can affect vision when motorists drive into the portal area. Technologies to prevent water leakage include vacuum injection of water seepage cracks and membrane-based waterpoofing systems. Tunnel inspection is also being improved through the use of technologies such as laser surveys and multibeam sonar. 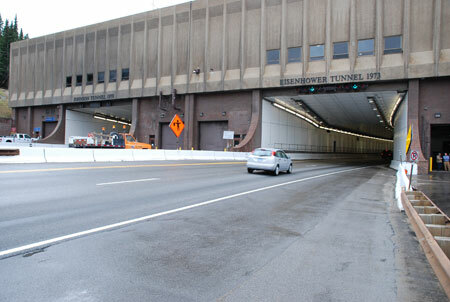 Tunnels visited during the scan tour include the Eisenhower/Johnson Memorial Tunnel in Colorado, which carries I-70 traffic under the Continental Divide. At 3,353 m (11,000 ft), the 2.7-km (1.7-mi) tunnel is at the highest elevation for a vehicular tunnel in the world. Also visited in Colorado was the Hanging Lake Tunnel (HLT) on I-70 at the midpoint of Glenwood Canyon. The 1,219-m (4,000-ft) HLT is one of the most technologically advanced tunnel systems in the country, with a traffic control and information center that tracks each vehicle traveling through the tunnel using a system of sensors and closed circuit television cameras. A fleet of emergency vehicles is stationed in the middle of the tunnel around the clock and emergency refuge areas are located throughout the HLT. 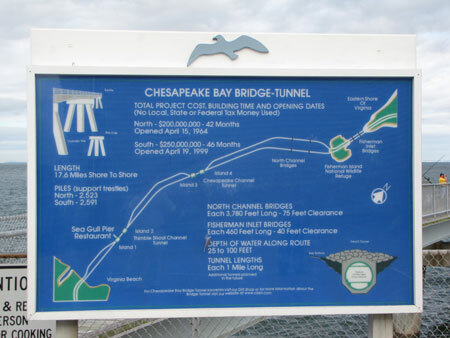 In Virginia, team members observed the Chesapeake Bay Bridge-Tunnel (CBBT), which connects southeastern Virginia and the Delmarva Peninsula (Delaware and the Eastern Shore counties in Maryland and Virginia). The CBBT consists of more than 19 km (12 mi) of low level trestle, two 1.6-km (1-mi) tunnels, two bridges, almost 3.2 km (2 mi) of causeway, and four manmade islands, totaling 28.3 km (17.6 mi) from shore to shore, plus 8.8 km (5.5 mi) of approach roads. Also observed was the Hampton Roads Bridge-Tunnel (HRBT), which includes bridges, trestles, manmade islands, and tunnels connecting Norfolk and Hampton in southeastern Virginia. During the summer approximately 100,000 vehicles cross the HRBT daily. The HRBT tunnels consist of two parallel single tubes built using the immersed sunken tube method. Prefabricated tunnel elements were placed using barges and then joined together in a trench dredged at the bottom of the harbor and backfilled with earth. State-of-the-art automated traffic control and video monitoring systems are used for traffic management and air quality is constantly monitored. Develop standards, guidance, and best practices for roadway tunnels. These standards should include, for example, design criteria for performance-based construction specifications; extreme events and tunnel security; vertical clearance, horizontal clearance, and sight distance; tunnel design life and future maintenance for structural, mechanical, electrical, and electronic systems; and fire and life-safety systems. Develop an emergency response system plan unique to each facility that takes into account human behavior, facility ventilation, and fire mitigation. A fire ventilation study should be performed and a fire ventilation plan developed and adopted for each facility. Many facilities also need to improve their procedures for directing the public to safety during an emergency. Develop and share inspection practices among tunnel owners. The team recommends that tunnel inspection programs be as similar as possible to bridge inspection programs. Those components of the tunnel that carry or affect traffic, such as roadway slabs and floor systems that carry traffic, should be load rated in accordance with the AASHTO Manual for Bridge Evaluation to the extent possible. Recommended practices for inspection frequencies, minimum code requirements, and a Federal coding manual also need to be developed. Consider inspection and maintenance operations during the design stage. The team found that inviting all disciplines to provide their input during the design phase results in a better product. 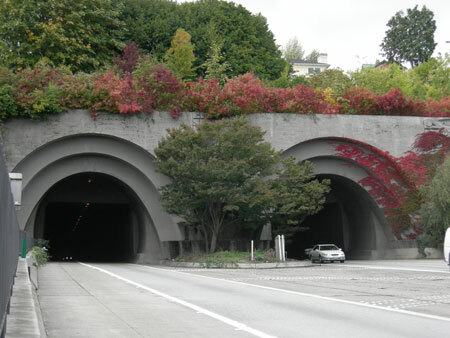 Develop site-specific plans for the safe and efficient operation of roadway tunnels. Agencies should develop a concise site-specific tunnel operations manual, as well as an incident response manual. Building a tunnel means a long-term commitment to provide funding for preventive maintenance, system upgrades and replacements, and operator training and retention. The decision to build a tunnel represents a long-term commitment by the owner. Agencies should develop an operational financial plan that addresses the need for future preventive maintenance, system upgrades and replacements, and operator training and retention. Share existing technical knowledge within the industry to design a tunnel. This knowledge base could include domestic and international tunnel scan information, past project designs, construction practices, emergency response best practices, and information on subject matter experts. To protect security, details and best practices should be shared without identifying the specific facilities where they are used. Provide education and training in tunnel design and construction. Since many agencies do not have in-house expertise on tunneling, providing access to education and training is vital. 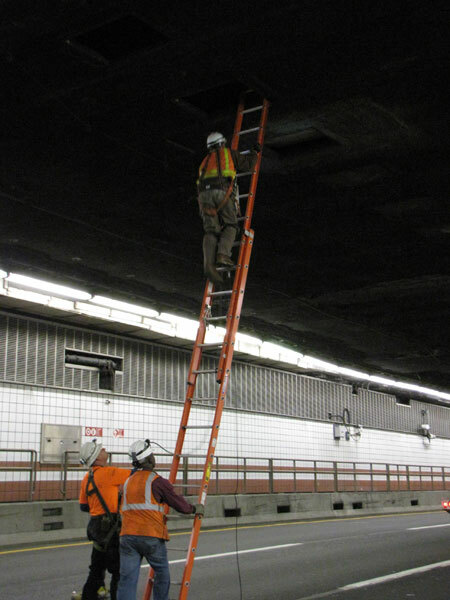 AASHTO will work in conjunction with FHWA and the Transportation Research Board, as well as the National Fire Protection Association and other tunnel-related organizations, to implement the recommendations. Work already underway includes an NCHRP project to develop Load and Resistance Factor Design specifications and guidance for new and existing tunnels. "Developing design guidance is the biggest issue for tunnels, as right now there aren't standards as there are for bridges," said scan cochair Kevin Thompson of Arora and Associates and former State Bridge Engineer for the California Department of Transportation. To download the scan report, Best Practices for Roadway Tunnel Design, Construction, Maintenance, Inspection, and Operations, visit http://bridges.transportation.org/Documents/NCHRP20-68A_09-05%20(1).pdf. For more information on the scan tour, contact Jesus Rohena at FHWA, 202-366-4593 (email: jesus.rohena@dot.gov). A 2005 international scanning team tour sponsored by FHWA, AASHTO, and NCHRP brought back innovations and best practices in designing, building, and operating tunnel systems in Europe. The scan focused on tunnel operations, including incident detection and deterrent technology and incident response and recovery planning. Also studied were tunnel systems and designs that provide fire protection, blast protection, and areas of refuge or evacuation passages for motorists. To download the scan team report, Underground Transportation Systems in Europe: Safety, Operations, and Emergency Response (Pub. No. FHWA-PL-06-016), visit www.international.fhwa.dot.gov/uts.